Missouri River as it meanders through the state of Missouri. excitement of the Lewis and Clark bicentennial should make that an easier job than usual. Evan McFarland belongs to the River Kids…a non-profit group made up of some 40 St.
environmental benefits of a cleaner river. But Evan also sees a public relations benefit. a grand finale cleanup in Kansas City in June. Architect Linda Chapman designed the store, which is in Ottawa – Canada’s capital. She says part of her assignment was to reuse as much as she possibly could. Being environmentally responsible is part of Mountain Equipment Co-op’s mission. It’s a non-profit cooperative. It’s million and a half members pay a small fee and have a say in how the company is run. Mountain Equipment’s Mark VanKooy says their members want the company to reflect their own environmental values. That mission resonates with customers such as Trevor. He’s been a member of Mountain Equipment Co-op for almost 20 years. Mountain Equipment Co-op has built eight stores – each greener than the last. When the Ottawa store was finished in 2000, it became the greenest retail building in Canada. In fact, there are too many features to mention. They seem to permeate every section of the building. It ranges from the wood floors salvaged from local barns to the high tech meters that control the intake of fresh air. Mark VanKooy says it cost an extra 10 percent to construct the building, but they’ll get that back in energy savings over the next decade, and he says that’s a key point in trying to persuade others to follow their lead. VanKooy gives lots of tours to architects and business people, but the building industry has been slow to adopt the idea. One of the biggest challenges is the way that buildings are typically constructed. Architects often come up with a plan without consulting the engineer or the construction manager, but in this case, they all sat down together from day one. They discussed each step in the process. The approach is called integrated design, and architect Linda Chapman says it ensured the environment was considered at every step along the way. She describes how the group chose materials to use in the walls. 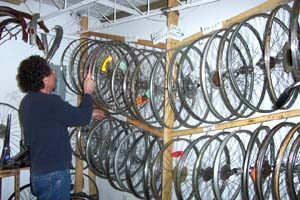 The Mountain Equipment Co-op did receive a grant from the Canadian government, but funding for this kind of project has mostly dried up. Still, proponents say interest in green buildings is growing. According to the US Green Building Council, 5% of new commercial buildings last year met its strict environmental standards. Retail stores such as Starbucks, Williams-Sonoma and the Gap have already built, or plan to build, green stores. 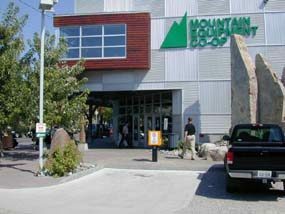 In Canada, the Mountain Equipment Co-op has added two more, that are even more energy efficient, and were built without government help. They say if a nonprofit outdoor retailer can do it, a lot of other companies can as well.